Report sent by Steve Fields: "With six races completed yesterday, the pressure was anything but off this morning, as today, the last day of the semi-finals, was the day to make it count. 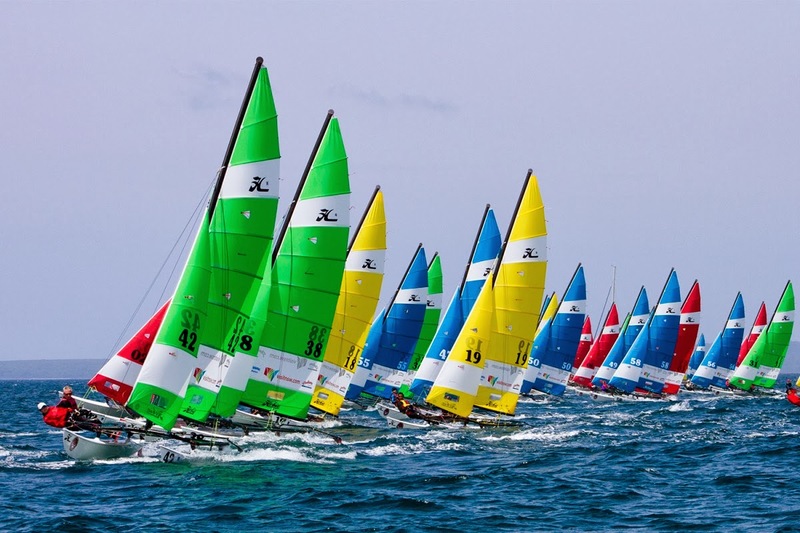 Tonight the fleet will be cut to the top 56 competitors all vying for glory in the Hobie 16 World Championships finals starting tomorrow. With sun and temperatures in the high 20’s plus a nor’easter running 10–20 knots, Jervis Bay couldn’t have done much better by our sailors today. Winds got up by around 9:30 and sailors scrambled to get on the water, all vying for the best spots on the starting line in what was set to be a great day of competition. Sweden were first off the line and looking strong but were overtaken at the weather mark by Jason Waterhouse and Lisa Darmanin from NSW Australia, taking first place. The Swedes held on to second while Denmark took third with Daniel Bjornholt-Christensen and Lachlan White moving up at the weather mark to secure a top three result. 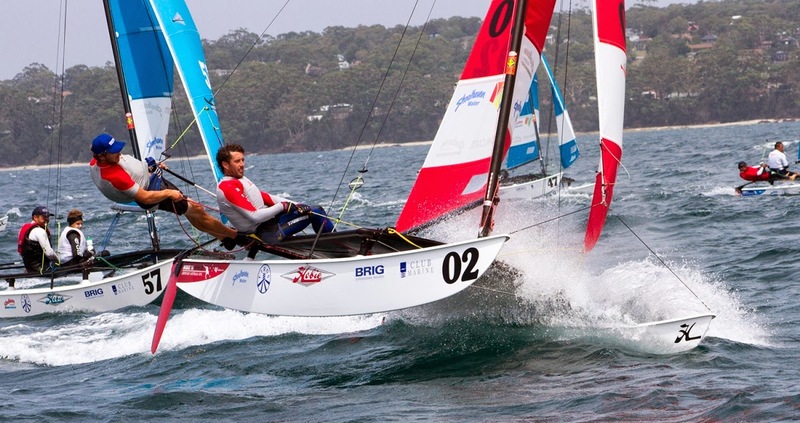 In race 4B, West Australians Gavin Colby and Josie Mark lead wire to wire, securing the top spot with New Caledonians, Jerome Le Gal and Marco Iazzetta chasing them all the way to take second. Third was picked up by consistent top ten placing, French competitors, Martin Orion and Hilliard Charlotte. Winds freshened to 15–20 knots in the last two flights of the day making for some pretty exciting racing. 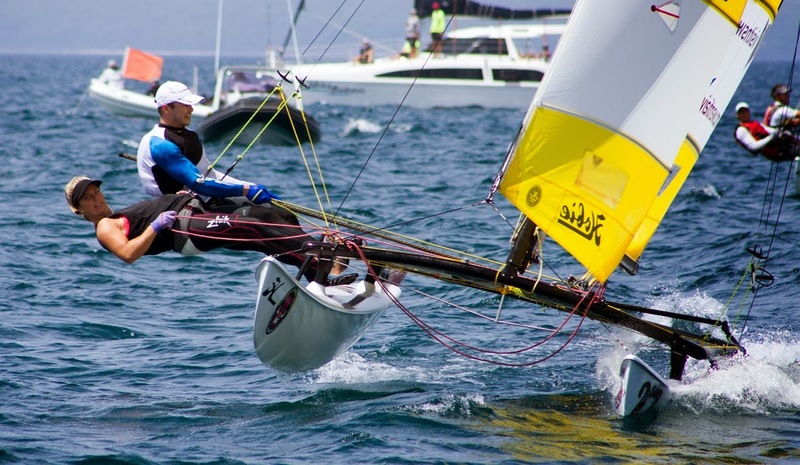 West Australians with wind in their sails, Cam Owen and Suzzi Ghent came from behind at the first weather mark to lead the charge all the way to the finish. Tim Shuwalow and Nina Curtis from Sweden moved up from fifth at the first weather mark to take second across the line while New Caledonians, Jerome Le Gal and Marco Iazzetta turned on the charm and moved up from tenth to take third! In the final flight of the day, 15 knots at the gate and Gusts up to 23 knots at the windward mark made for some pretty shifty conditions in race 5B. Jason Hess and Irene Abascal from Guatemala battled it out with James Wierzbowski and Pip Pietromonaco from Victoria, Australia for the top spot with the Guatemalans ultimately claiming the victory. James Wierzbowski and Pip Pietromonaco took second seeing a return to the top three for the pair while West Australians, Gavin Colby and Josie Mark took third. Once again, Jervis Bay did not disappoint and with the help of our sailors, delivered yet another sensational days sailing! Overall results will be announced at this evenings cut party when the final 56 will be revealed. Stay tuned and check the results page to find out who made the cut and who will be back on the water tomorrow in the quest to be crowned World Champion!"